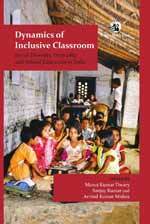 Dynamics of Inclusive Classroom explores the challenges and possibilities of rendering classrooms more inclusive by contributing to a better understanding of the educational needs of socially diverse children in India. The contributors to this volume show how, in a world of rapid social, political, economic and educational changes, social diversity, inequalities and social exclusion/inclusion are subjects of great import. Part of this process is the significant increase in the number of children from socially diverse backgrounds in the classroom. This increase calls for a better understanding of their needs and for processes that render classrooms more inclusive. In India, the increased enrolment of socially diverse students requires us to give special attention to issues of inequality based on caste, class, religion, gender, language and region, which affect children's learning processes and outcomes. This volume is based on a great variety of research, drawn from academic analysis, policy formulation, and classroom practices. Collectively, the contributors argue that, in order to render Indian classrooms inclusive, the country needs to formulate a school education policy that would result in pedagogical preparedness to deal with the increased enrolment of historically marginalized and oppressed children from diverse backgrounds. Through case studies and field examples, the authors demonstrate the processes and practices through which learning can be made inclusive and democratic in Indian classrooms. This book offers fresh insights into diversity and contemporary educational practices in India and will be of considerable interest to students, scholars, practitioners and policy makers involved in education, development studies, social work, sociology, history, and public policy.